It is a station where the vehicles that run on roads can load or unload a cart. It acts as the initial or the final position for such vehicles when using PACT. PACT terminal would consist of 2 ramps, one for boarding the cart and the other for unloading it, a cart store where the carts will be stored and an appropriate cart would be provided to each vehicle. From the cart boarding ramp a one way track would come out and emerge into the main carriageway. 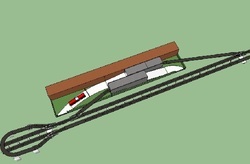 Similarly another one way track would branch out from the main carriageway and go into the cart unloading ramp. PACT Terminals will have 2 gates, one for vehicles to enter and the other for vehicles to exit. The entry gate would lead the vehicles into the cart boarding ramp. On the way between them, there would be sensors which will determine the mass and the dimensions of the vehicle. The vehicle will also be asked to choose its destination and a subsequent fare amount will be deducted from the prepaid account of the vehicle. Not every vehicle which runs on road will be allowed to use PACT through this station. The vehicles will need to be registered under some authority and have a prepaid account to use the PACT for now. To promote the cause of using public vehicles and reduce the private vehicles on roads, privately owned vehicles won’t be allowed to use PACT for now, unless they are important ones such as emergency vehicles.